Can Public Housing Drive Neighborhood Transformation? New Urban Institute research suggests that making extreme changes to public housing—like demolishing and rebuilding it— can benefit not only the public housing site and its residents, but the greater neighborhood as well. In his 2003 book, When Public Housing Was Paradise, JS Fuerst depicts early public housing as a vehicle of upward mobility, moving working class and immigrant residents out of slums and tenements beginning in the late 1930’s. But, Fuerst demonstrates, by the 1980s, public housing had become synonymous with poor housing conditions, crime, and violence, stigmatizing many residents and cutting them off from the larger community. The Department of Housing and Urban Development launched HOPE VI in 1992 to improve public housing conditions and to break up the clusters of very low income families that were the legacies of previous public housing strategies. Massive high rises with hundreds of units tucked away behind giant brick shields have been torn down and replaced with buildings that encourage safety and community through greater street access, ties to the surrounding neighborhood, and extensive social services. Initially, HOPE VI architects expected original residents to benefit, moving back in after redevelopment. That did not typically pan out. Instead, long redevelopment timelines and stricter regulations often meant a completely different set of residents moved into newly built units. So while HOPE VI emphasized the place, redevelopment also changed the face of public housing residents. 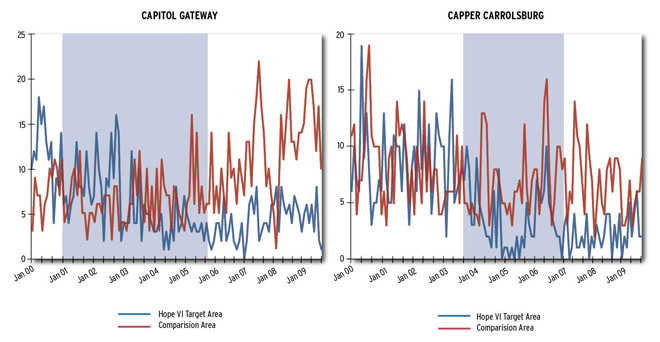 Crime reduction was part of the HOPE VI plan, and in 2010 the Urban Institute analyzed the impact of HOPE VI on crime in the immediate and surrounding areas of two sites in Southeast Washington, DC. Both Capitol Gateway (formerly East Capital Dwellings/Capital View Plaza) and Arthur Capper/Carrollsburg were built in the 1950s, and had long suffered from violence and concentrated poverty. Both were also home to redevelopment beginning in the early 2000s. The graphs here show criminal incidents in the units before, during, and after the HOPE VI reconstruction. The blue lines are the public housing developments targeted by the program, and the red lines are comparable public housing developments that were left alone. The grey box indicates the construction period, when the development was empty of residents. As the graphs show, crime fell during the reconstruction and stayed low afterward—not the case in comparable housing units. HOPE VI appears to have reduced crime by as much as 60%, and, as crime fell in the targeted units, it dropped in the surrounding neighborhoods too. These results in DC were confirmed in Milwaukee, Wis., where crime in a HOPE VI site dropped about 50% after redevelopment and stayed low even when residents moved back in. Crime in a similar Milwaukee public housing development (that wasn’t redeveloped) did not drop as dramatically. The findings suggest that HOPE VI can boost safety in public housing and depressed communities and that we may be working toward a time when public housing can once again be a step up in society. The full report detailing the analyses in both Milwaukee and Washington D.C., is available here.